Live From Toronto, Canada: Vineyard Music EXTRA! This review is of the Vineyard revival releases of Winds of Worship Volume 3: Live from Toronto (VMG-9191), Winds of Worship Volume 7: Live from Brownsville (VMG-9210) and from the Integrity/Hosanna release Revival at Brownsville (10492). At last count there have been close to 1.6 million visitors to Brownsville Assembly of God in Pensacola Florida since the revival hit on June 18, 1995. A conservative estimation of salvations was listed at 93,094 as of 13, February, 1997. 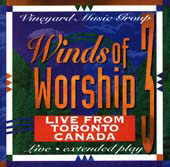 The Toronto outpouring started in 1994 in what was then the Toronto Airport Vineyard. With International flights coming in around the clock, layover passengers were being drawn by the thousands weekly to the church located near the Toronto International Airport. Thousands have made professions of faith at the Toronto church now known as TACF (Toronto Airport Christian Fellowship.) John Arnott, Pastor of TACF has left the Vineyard fellowship but many Vineyard musicians still perform there. On the Winds of Worship 3, David Ruis (Winnepeg VCF) and TACF worship leader Jeremy Sinott lead the congregation in what has become standard songs of revival. Sweet wind, We will dance, Blessed be the name of the Lord, and Refiners Fire are all present in strong anointed versions. I personally know a couple who visited Toronto and were convicted of every sin they had ever done by the power of God. The music herein conveys the anointing. 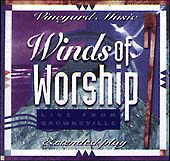 Winds of Worship 7 from Brownsville features VCF worship leader Andy Park and Brownsvilles Lindell Cooley and a 120 member choir recorded live from worship services in July of 96. Park, best known as writer of such revival hits as The River is Here and We will ride shines on such Vineyard classics as His love, I see the Lord, and Draw Me Close while Cooley brings us into the presence of God with Let the River Flow, One Thing I Ask and the Holy Ghost inspired He set me free. The Brownsville music has been attributed to Cooleys love for Vineyard music and its frequent use in services. I have friends who visited Brownsville and never knew most of the music used is Vineyard Music. Integrity/Hosanna Records has also issued a CD of Brownsville music which features no less than a third of Vineyard Music titles. Cooley has combined Andy Parks Spirit of the Sovereign Lord with Rich Mullins Awesome God to create a masterful worship piece. New every morning (Scott Underwood), and We will ride (Andy Park) are all outstanding as well as two by co-written by Lindell himself. The fires of revival are sweeping across America as well as Europe, India, and its coming soon to your town. Doug Martin <innercity@juno.com> Louisville, Kentucky, USA is a former Pastor who is currently booking concerts in the U.S. and is a reviewer for VMG.